Whatever you do, don’t ask Richard Ayoade whether his new film, The Double, was inspired by Terry Gilliam’s Brazil. He’s heard it before. In fact, the comparison has proven so reflexive that, by the close of the festival where the film premièred, the soft-spoken but exceedingly eloquent British TV star turned indie director was already a bit too familiar with the question. In a Film.com interview from TIFF, Ayoade graciously explained that the reference “just feels inaccurate in some respect, and more to do with production design ultimately, and even then I don’t think it’s particularly analogous.” Ayoade’s response wasn’t petulant, and he was quick to acknowledge that it’s something of an honor to be mentioned in the same breath as Brazil. But he’s right to observe that his film is its own beast. 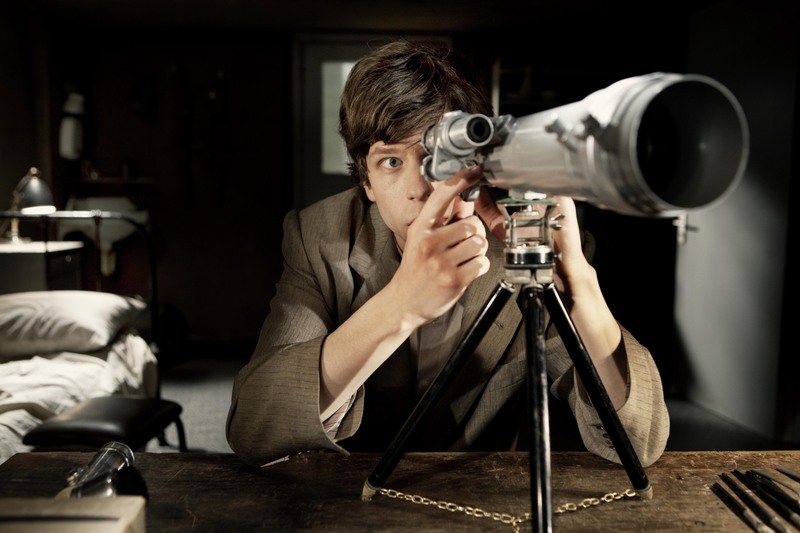 Set in a bureaucratic dystopia with the foggy borders of a nightmare and the look of a steampunk Pyongyang, Ayoade’s confident second feature follows a meek office clerk named Simon James (Jesse Eisenberg) who is shocked when his company’s newest hire is his shamelessly confident doppelgänger, James Simon (also Jesse Eisenberg). Most horrifying of all, nobody in Simon’s office seems to notice that James is his carbon copy. The strange arrival seamlessly squirrels his way into Simon’s life, taking credit for his work and romancing Hannah (Mia Wasikowska), the cute co-worker Simon is obsessed with. Simon is challenged to assert his value as an individual and own the side of himself he’s suppressed his whole miserable life. With a surgeon’s precision and a hangman’s humor, Ayoade peels apart the male psyche. The Dissolve sat down with the director in Magnolia Pictures’ Manhattan office, where he spoke about his new movie, the perils of three-dimensional supporting characters, and why Michael Bay is contemporary cinema’s most influential filmmaker. The Dissolve: In the world of your film, everyone is miserable, and no one is doing anything about it, including the protagonist. Simon meeting his doppelgänger is maddening for him, but is it also the best thing that’s ever happened to him? Richard Ayoade: It was important for Avi and me in the writing for the doppelgänger not to feel like an event. There’s a version of this where you have someone who’s slightly apart from everything, and doesn’t fit in. Or, conversely, everything is going just fine for him, and then one day something happens that upsets the balance. But really, the doppelgänger is an indication of a psychological state. So rather than being an inciting incident, as Robert McKee would put it, it’s a materialization of something that’s occurring to him. In a way, I feel that the Dostoyevsky book prefigures the idea of the shadow—the idea that there are things you can’t accept about yourself, that you have a side to yourself that is not completely altruistic and caring, and if you can’t accept that you have these base and destructive urges, you’ll have a crack-up. That’s really what the doppelgänger is. The Dissolve: Essayist Victor Terras said about the novella, “The human will, in search for total freedom of expression, becomes a self-destructive impulse.” Watching your film, I felt the opposite, that denying freedom of expression can be destructive as well. Simon seems caught in a very uncomfortable middle ground between the two. Ayoade: Well, he’s unable to get over himself, and he’s unable to connect to other people, and that’s partially a function of the world and the norms of it. No one is interested in having a relationship with anyone else, which is an extreme form of city life. It’s impolite to look at people in a city, and in a way, you dedicate yourself to not engaging with people, because it’s dangerous, because you feel like “What if I can’t get rid of this person?” And people are terrified of that, because there’s no way of controlling that. It feels like it’s too big to govern, and it’s just not rounded. But also he’s overly concerned with himself and his own place in it, and he’s brooding quite a bit, so I don’t think he’s a blameless character. The Dissolve: I appreciate that the film exists beyond a banal dichotomy of Simon being a good person and his doppelgänger being his evil version. The film isn’t didactic. Ayoade: That’s what I like about that book in particular, or Dostoyevsky in particular, is that there’s a lack of didacticism in his writing. He’s very good at going into the most uncomfortable areas of people’s personalities in a way that feels unjudgmental, or he has such imagination that he can fully inhabit it without feeling disapproving. As opposed to… I feel sometimes like 1984 is a bit more instructional, and is very much this evil totalitarian state vs. the little person. Whereas The Double isn’t really like that—no one is rebelling against the state, and it’s not kept intact by extreme coercion or punishment. The Dissolve: That’s part of what made me feel as though Simon and the people around him are responsible. There’s The Colonel, but you never see him cracking the whip. Ayoade: In a way, he’s like a relatively benevolent father figure. You kind of feel like if you were able to have access to him rather than just middle-management, things would be better. Simon wants to engage with him… He’s in no way like an autocrat. The Dissolve: The idea of The Colonel being a benevolent father figure is what kept returning me to the idea of the film world being like an idealized version of North Korea. The Dissolve: Particularly the design of Simon’s apartment complex. It’s a North Korea where everyone has the freedom to leave, but nobody chooses to. Ayoade: Well, it’s strange, because one of the reasons to put the story in this specific world was to address that question, “Why don’t you just go?” It was to create that feeling that there isn’t something better over there, that if you just went a little bit over there, you’d suddenly be in the Bahamas. You feel as though somehow there is nothing else. In the same way that in an Edward Hopper painting—or anything that’s framed—there’s a sense that they can’t walk out of it. There’s something about trying to pin the characters in the world, so you don’t say, “Why doesn’t Simon get a better job?” Or, “Why doesn’t Simon just move to a nicer apartment? It seems like there might be some nice real estate over there…” So that was important. But it’s more that you don’t really get the sense that someone is living it up elsewhere. This is a really specific example for someone who hasn’t seen the film, but the Honor Lounge doesn’t look like it’s going to be some utopian great place. Maybe there’s some leather chair or something, but it’s still going to be the same setup. There’s no great, better life over there. The Dissolve: At the same time, all the characters—even the older men populating Simon’s office, who have presumably been there since time immemorial—feel as though they have a spark of inner life. Can you speak to the idea that everyone, even the most dyed-in-the-wool bureaucrat, has that spark in them, that unknown side? You have access to the main character’s thoughts by virtue of the point of view of the story, but you need to experience the other characters through [the protagonist’s] eyes, as it were. I sometimes feel as though there can be an undue attempt at objectivity in stories under the guise of… Partially, everyone who isn’t the main character has to play something, and they are three-dimensional people, and they all have home lives, and the actors who play them can’t just inhabit story beats, they have to know who the characters are. So Mia, playing Hannah, needs to know what Hannah does when she’s not being watched by Simon, but there’s an extent to which the story is Simon’s point of view, and these other characters need to engage with him in a way where they are almost unknowable, in a strange way. And I think that’s true in a lot of stories: The fact that you can’t quite read someone else is often what’s attractive about the dynamic. The Dissolve: There’s a counterargument that Hannah’s character is something of a Manic Pixie Dream Girl, but the whole world of this film—from the people to the subways to the malfunctioning elevator—is an expression of Simon’s psyche. So Hannah, who isn’t in the novella, serves a very explicit purpose in that regard. Ayoade: I think that’s part of narrative. Point of view is very important; balance isn’t. That would be a news report. And even with those, you’d be suspicious of the implication that a news report could even be balanced. And I think that’s fine, that’s part of the experience. There’s an element in Taxi Driver—and that’s a perfect film—but the scenes between Betsy [Cybill Shepherd’s character] and Albert Brooks’ character, there’s something where you just know that it isn’t the meat of the film. In some sense, you can almost feel that it’s like, “We can’t just have her be some girl that he looks at, because that’s…” But I think you can. I think that can be very interesting, that someone doesn’t know someone else. Like Turgenev in [the 1860 Russian novella] First Love, he just doesn’t know that woman. Or in The Go-Between. That’s just part of the function of the story, the unknowability. But there’s a separate problem, which is unrounded female characters in roles that should be rounded. But a rounded female character is not the specific lens of Vertigo—that’s a film about someone trying to mold someone to his own will, and not recognizing that she has a life separate to his perspective. And if you lose that lens, you lose the story. The Dissolve: Simon is creating Hannah for himself—as he sees her, she only exists in his head, and with the scraps of her shredded artwork, he literally puts her together. If she becomes a cliché, it’s because he’s transposing that onto her. Ayoade: Yeah, and it’s inhumane, and it’s not a genuine connection, and that’s why Hannah doesn’t respond. He doesn’t know her at all. And that’s part of the problem. I think you’re so used to films about a character’s desires being thwarted, and that essentially being a bad thing. You know the age-old question of “Who do we relate to?” Well, I always think, “Who is interesting?” We relate to people in an advert because that person is specifically designed to represent you, and it’s meant to make you feel like this person because you also do the same thing. But in a story… I don’t know, do you want to relate to King Lear? [Laughs.] I mean, you have compassion for him, and you’re fascinated by him, but the idea of making him more re-late-able seems like such a modern, commercial concern. The Dissolve: When you make a movie with such a palpable, immediate style, it aggressively invites comparison to previous work. Journalists have compared The Double to many different movies: Brazil, After Hours, The Trial, Alphaville, the films of Aki Kaurismäki. For me, it was Roy Andersson. When everyone brings a different filmmaker to the table, do the comparisons start to twist into a compliment? Ayoade: I don’t know, really. There’s a specific concept to interviews around the time of a release which is… Well, there’s an elephant in the room, and that’s sales. And there’s an extent to which both parties… Like, journalists are sort of addressing their audience and going, “Is this worth your time?” And in some senses, the subject is cast as someone who’s trying to defend the film, or make a case for it. In a way, I’d love to not have to make a case for it at all. It’s just not something you want to hear the person who’s made the film do. For some people, like Quentin Tarantino, it’s sort of fun watching his sales, because it’s so well worked out, it’s almost an enjoyable performance to watch. Whereas there are other directors I really like where you can tell it’s not what they’re good at, and it’s almost like the specific reason why they’re good at the thing they do is also the specific reason why they should not in any way be talking about the reasons you should see it. And I feel slightly like that in terms of talking about influence, because it just always sounds either like protesting too much, or defending, or… For me, it’s difficult to tell… I guess most directors now, many generations in to the history of cinema, come to directing as fans of film, and so tend to be relatively well-versed in film. I don’t know that there are many who would just be unaware. What’s interesting to me is that all of those directors you mentioned were all accused of being derivative themselves. And the new benchmarks of people who derive from… Someone like David Fincher, he was seen as a derivative director himself, at times. So I don’t know what it means. The Dissolve: For a cinephile, there’s a thrill in talking to anyone about someone like Roy Andersson, let alone talking to a filmmaker who may have been influenced by him. 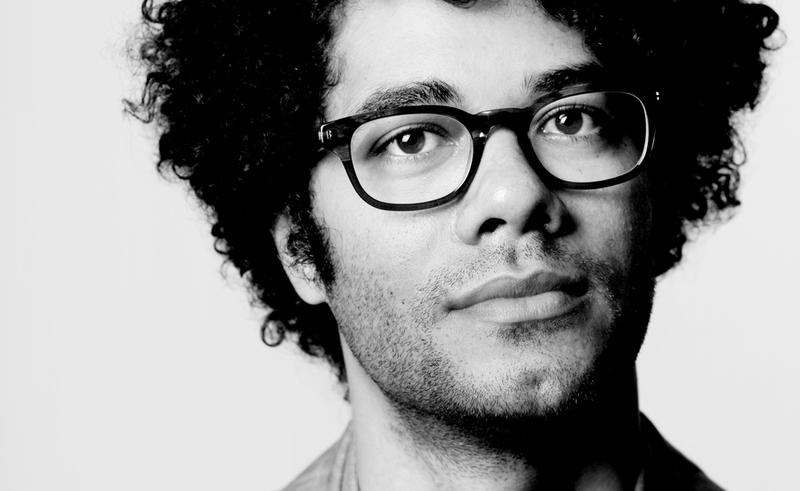 Ayoade: I really like him a lot. I think he’s amazing. It’s strange, because it’s almost hard to work out where it comes in, because the two films I’ve done have been adaptations, and reading the source material, there’s an extent to which you already have an idea of what your film version of it will be like. For example, I’ve recently been reading George Saunders, and I’ve been thinking, “Oh, this is Roy Andersson’s world. This has the same kind of feel to me as a Roy Andersson film, albeit in an American way.” Those strip malls, those hospitals, it just feels the same, like it comes from the same perspective as his films. You have a sense of what it’s like almost immediately, but when you’re making it, in some ways you’re using your awareness to try and not to do that same thing. For example, with us, we knew anything with a bureaucracy and a retro office feel is going to be compared to Gilliam, but the difference we felt was that ours was filled with a sense of personal loneliness, which to me was more like Kaurismäki. That was our kind of thing. Or In The Mood For Love, just the way those offices felt like they had no context. We don’t really have wide shots in this film, you just feel like you’re thrown in. Yeah, I agree with what you were saying about how stylized films invite comparison more than, say… How every film is really heavily influenced by Michael Bay, who is the most influential director of modern times. Or Tony Scott. And that everything has that kind of tracking, hunting, drifting camera thing with an anamorphic lens… That’s the house style of cinema now. Whereas Jean-Pierre Melville is not the house style. The thing that’s strange about cinema style is that a totally impossible thing, like having a shot of one person, and then a shot of another person that visualizes a total flip of the axis, that’s so strange, but that’s part of film grammar, and therefore “natural.” Whereas a held two-shot is stylized. The Dissolve: The music in the film is incredible. Andrew Hewitt’s score is so inextricable from the film’s world, I’m curious about at what point of the production you invited him in to the creative process. I’m also curious about the pop songs you used. 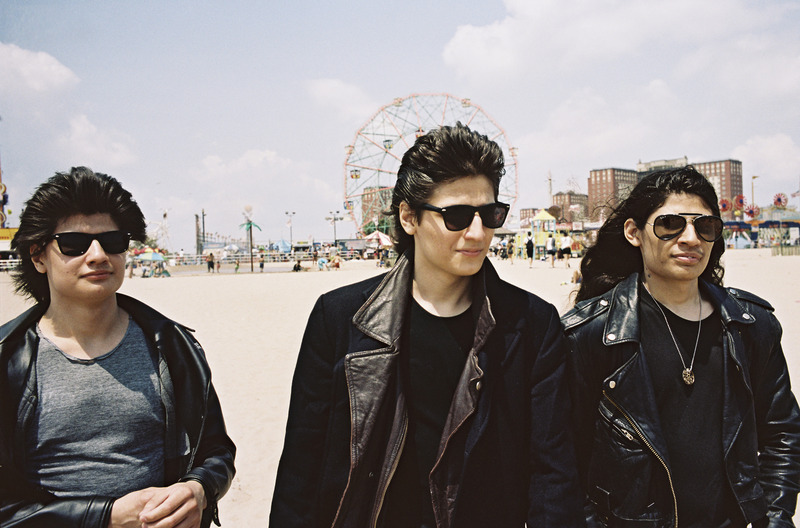 Kyu Sakamoto, Danny And The Islanders… In the context of this story, their music feels like propagandistic lullabies from an alternate past. Ayoade: Well, with Andrew it was very early. I bring him into the process as soon as I can, as soon as there’s anything to read. He’s always very reluctant to start soon, he always wants to wait, and I would rather he do most of the composing before we start editing. In an ideal world, it would be written before we even started shooting. A friend of mine directed me to this Schubert song cycle that included a piece called “The Doppelgänger,” and so a lot of Andrew’s score was influenced by that feel. But that became apparent later. We thought it might just be an element, but really the whole score became based around that motif. It just happened during the edit; it’s just a process. That’s why I really like working with Andrew. I’ve known him for 15 years, since university, so I feel like I’m able to do that rather than having somebody come in and score the movie after it’s already too late. This way, it’s like working on a script, in that you can have multiple drafts and a good deal of wasted stuff, but it’s all still pretty good going. It’s much better than the writing hit rate, which is like one in every 20 drafts is okay. And then the songs were used because I didn’t want the film to be geographically placed in any way—that’s why everyone in the cast uses their own accents. Mia’s accent is half-Australian and half-American, and she kept saying that everyone was going to think she was just doing a bad American accent, but I liked it. I really liked that her voice wasn’t one or the other. So the Japanese and South Korean songs were just to have something that wouldn’t necessarily evoke this era and this time, to have this slightly other world.